Hamptons Medical Associates Providers Britni Saint John, A.R.N.P. 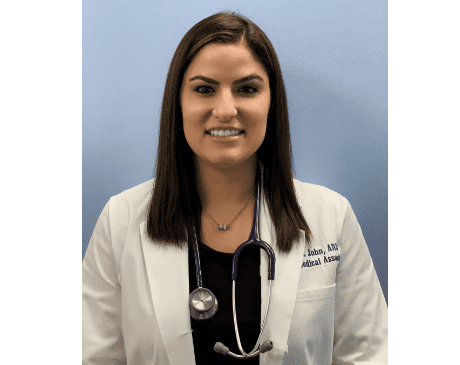 Britni Saint John, is a Board Certified Family Nurse Practitioner who received her Master's Degree from Simmons College in Boston, Massachusetts. Britni graduated with academic honors and is a member of Sigma Theta Tau Honor Society of Nursing as well as a member of the American Association of Nurse Practitioners. She began her career at the Children’s Hospital of Pittsburgh, where she was honored with the DAISY award for extraordinary compassionate and skillful care. She has 8 years of progressive nursing experience with telemetry, neurosurgery, orthopedics and trauma patients. Throughout her career Britni has served as a preceptor for nursing students and a mentor to novice nurses. Her professional interests include both adult and pediatric preventative medicine, patient education, women’s health, sport/school physicals, travel medicine and aesthetics. Britni believes in fostering a trusting relationship and environment between the provider and the patient where the patient feels safe to be and to share. Britni’s experience and compassion make her well suited for the family practice setting and we are happy to have had her join our Hamptons Medical Associates team in 2016! Our office is in-network with most PPO plans. Before your visit please make sure to call and verify that we accept your insurance. Additionally, if you don't happen to see yours listed on the right, please feel free to call and inquire.